Imagine turning up for a party a whole day early. Wouldn’t that be terribly embarrassing? Now imagine you’re one of the horsemen of the apocalypse, and you’ve turned up for the end of mankind hundreds if not thousands of years early. A faux pas of truly epic proportions. That’s what’s happened to War, poor lad. Even worse, he’s ended up with the blame for triggering the apocalypse early and wiping out the human race. Somebody tricked him, all signs point to that lovable prankster Satan, and so he sets off back to Earth to express his displeasure at the situation. Predictably perhaps, you’ll be doing your best to fix the balance of the universe by hitting things with an amusingly large sword. Repeatedly. Screenshots and videos may put you in mind of God of War; buckets of blood, gory finishing moves, oversized weapons (oo–er missus, etc), demonic enemies, and suspiciously orb–like collectables flying from fallen enemies and smashed chests. Indeed, Darksiders is at its heart a roaming fantasy beat ’em up – but it actually owes much more to the Zelda series. Bomb plants, the megaton hammer, Epona, and the grappling hook are all emulated here, with the graphics being the biggest difference. The glaive you soon get hold of works exactly like Link’s boomerang. 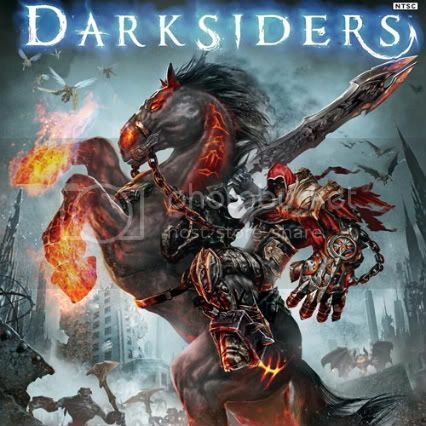 If Nintendo decided to unleash the lawyers, Darksiders would be ripped to shreds. In the last leg of the game you’re given an item that, for a few hours, turns the experience into a Portal homage. At least Vigil Games are copying from the best titles. So, this isn’t a game that’s big on originality; and it must be said that it never manages to capture the charm, inventiveness, or sense of wonder of its inspirations. Thankfully however it tries its very best, and manages to deliver a good time. 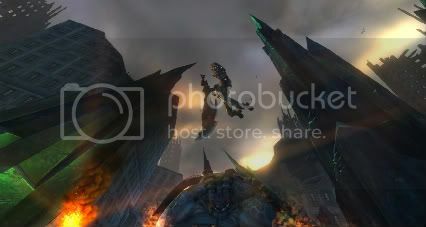 It must have been very tempting to paint the literally post – apocalyptic world with nothing but greys, browns and beige; but Darksiders features admirably colourful locales and enemies, with reds and blues being particularly evident. The aforementioned enemies tend to be more toothy than Esther Rantzen and Janet Street Porter combined (if you don’t know, google for images). You fight puzzlingly heavily armoured angels as well as demons, and we like to think that gigantic heavenly gnashers lurk beneath those helmets. At any rate, you’ll be carving through them all with a sword. You can soon buy a scythe, and you’ll get hold of a gauntlet, but that’s about it for variety of melee weapons. The ‘souls’ that you collect come in three flavours: minty green for your health, banana yellow for your ‘wrath’ meter (which is used for wrath abilities such as poisoning surrounding enemies, or boosting your defence), and spearmint blue for spending money. As you progress you’ll unlock the obligatory replenishers for your various meters to purchase, as well as special moves and combos. These unlockable moves seem rather superfluous, however; weak enemies are easily despatched with the classic attackattackattackattackattack button bashing method, while most stronger enemies can be seen off with attackattackattack dodge attackattackattack dodge attackattackattack. This is going to hurt you more than it’s going to hurt me. Whether you go for cheap button bashing (like us) or taking advantage of the various moves and combos up for grabs, combat is fun. It’s hard to put your finger on exactly why, but overcoming huge waves of enemies – and all that blood – probably has something to do with it. It just never gets old, and this is just as well. There are dozens of puzzles in Darksiders, but very rarely will you find one where the answer isn’t immediately obvious; combat will take up most of your time. Once you’ve passed a certain point in the story, you can take on a ‘Chaos’ form for about ten seconds at a time, a super–powerful flaming beast with… a sword. Every hit you land on an enemy in your regular form fills up your Chaos meter a little, and when it’s full, you’re able to activate this angry chap. You soon learn to save it for when the more powerful enemies gang up on you. As for the most powerful enemies of all, well… after your first boss fight, you’ll always be hungry for the next, craving it like a forgotten celebrity on a reality show craves attention. Here is a game that knows damn well how to deliver a good boss. Huge and evil looking every one of ’em, even the smallest towering over War with powerful attacks at their disposal (though at the end of the game… well, you’ll see). They all end up meeting a very gory God of Waresque end too, designed to get the testosterone flowing – um, if you’re male – and encourage you to scream RRRRAAARRRGGGHHHHH in victory. I DON’T need the feather! I just need to flap my ears! It would be unfair to say this was a strictly one–note game; the previously mentioned Portal style puzzles, while epically derivative, are something completely new in the context of the gameplay. At other points you’ll be fighting on horseback, piloting a flying angelic, er, thing, tackling the puzzles, or using your grappling hook to swing around like an apocalyptic Tarzan. Nonetheless, you’ll spent the biggest chunk of the game hacking your way through waves of enemies. The script is the only thing about the whole game to offer a spark of originality; but the dialogue could have come straight out of a Saturday morning cartoon, drenched as it is in melodrama. It’s entertaining nonetheless, and the ending almost (almost) ties up all the loose ends. The game itself, apart from a slightly tedious fetch quest just before the big finale, keeps up a good pace. It may be low on new ideas, and sometimes outright steals from other games; but it manages to carve an identity for itself, and to entertain effortlessly.